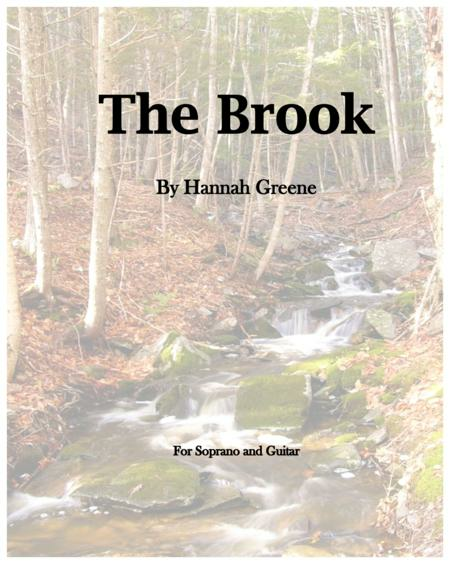 Composed by Hannah Greene. 21st Century, Contemporary Classical, Modern, Recital. Score. 9 pages. Published by Hannah Greene (S0.70783). 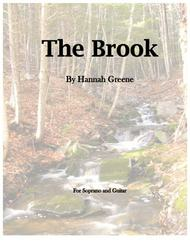 "The Brook" is a beautiful poem written by Lord Alfred Tennyson. Soprano Sarah Cambidge and guitarist Travis Chastain (both Alumni of the University of Denver) commissioned the poem to be set to music. Throughout the piece, the juxtaposition of life and death, consistency and change is represented by contrasting different timbres of voice and guitar. It is also represented with a change in time signature using both duple and triple meter, and by rhythmically placing two notes against three. The piece moves through three different stages of life—beginning, middle, and end—then cycles back to the beginning. "For men may come and men may go, but I go on forever. "Premiere performance by Travis and Sarah: https://www.youtube.com/watch?v=UMlP32IFpiUWork is ~6 minutes long.